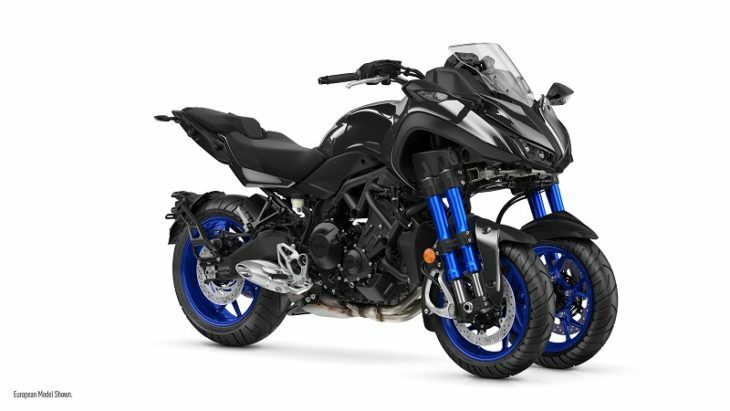 Cypress, CA – November 6, 2017 – More information was released today for the NIKEN leaning multi wheel (LMW) motorcycle that Yamaha Motor Company recently unveiled at the Tokyo Motor Show. Production of the NIKEN, and subsequent distribution for sale in the US market, has been confirmed by Yamaha Motor Corporation, USA, and will begin in the second half of 2018. Yamaha is a company that thrives on creativity. Since Yamaha Motor was founded in July 1955, the Iwata-based company has been responsible for developing and introducing some of the most ground breaking and influential motorcycles and scooters that have gone on to change the landscape of the motorsports market. Innovation is the very lifeblood of the motorcycle business, and Yamaha is always looking to the future in the quest to develop original and exciting new technology and radical new concepts. The launch of the first ever production 3-wheel leaning motorcycle demonstrates the company’s commitment to innovation, and is another example of how Yamaha ‘Revs Your Heart’ with its exciting and diverse range of models. At the Tokyo Motor Show in October 2015, Yamaha displayed the MWT-9 prototype, a 3-wheel concept motorcycle that gave a tantalizing glimpse of the future. Now, just two years later, Yamaha reveal the all-new NIKEN, the world’s first multi wheel production motorcycle that is ready to open up new possibilities for those forward thinking riders looking for a whole new experience. Meaning ‘Two Swords’ in Japanese, the word NIKEN originates from 17th century Japan when the two-sword style of swordsmanship was first invented. It proved to be a revolution, and marked the beginning of a new era in combat. With the NIKEN, Yamaha opens up the possibility of a whole new era in motorcycling, a riding revolution – offering a sensation that is unique. Imagine the ability to carve through winding roads with unmatched confidence…a new feeling that could be compared to the thrilling experience when carving turns with skis. This revolutionary new kind of motorcycle feels, handles and looks like nothing else. At the same time as being different to a 2-wheel motorcycle, the NIKEN’s handling characteristics are also reassuringly familiar to riders. The advanced Yamaha-exclusive technology used in the double leaning front wheel layout offers high levels of traction – making it a strong performer in corners and giving the NIKEN rider the ability to carve through winding roads with unmatched confidence. And two front wheels means there are two front tires and two sets of front brakes, so the levels of traction and braking are also like nothing else on the road! The NIKEN’s unique leaning multi wheel (LMW) system offers very sporty and confident handling characteristics, together with enhanced feelings of stability and grip when cornering in a wide range of surface conditions. Yamaha’s engineers have gone to great lengths to ensure that the character of the NIKEN is similar to that of a conventional motorcycle, and the majority of riders will be able to transition seamlessly from a two wheeler to the Yamaha LMW system without having to alter their riding style. But as soon as they enter into a corner, NIKEN riders will feel growing levels of confidence and enjoyment – offering more fun with less stress. The NIKEN’s sporty handling performance is designed to complement its high overall specification and enable riders to realize the optimal potential of the torque-rich 847cc crossplane concept 3-cylinder engine. The NIKEN’s muscular and athletic body design clearly shows that this innovative new 3-wheel Yamaha is designed for energetic riding. The twin front wheels form the focal point from which the futuristic cowl and integrated fuel tank flow, giving a unique mass forward look that emphasizes NIKEN’s bold and unique profile. Yamaha’s designers have sought to highlight the distinctive technology used in the LMW system, and rather than being hidden away, the structure and workings of the Yamaha-exclusive mechanisms are there for all to see. From the rider’s viewpoint the NIKEN has a rugged wide-shouldered appearance that contrasts with the slim fuel tank, giving a unique riding style unlike any other motorcycle. The upward curving main seat features a wide, flat design with excellent rear passenger support that gives high levels of comfort. The sporty front face features lightweight dual LED headlights housed in a downward curving aerodynamic cowl that looks like nothing else on the street. The broad nose cowl and sport screen give the NIKEN rider good protection from the elements, and together with the natural riding position, this advanced LMW is ready for everything from thrilling corner carving through to sport touring over the weekend. YZF-R1 derived mirrors feature integrated LED turn signals, and are designed to give a clear rear view even when the riding position changes. In contrast to the broad-shouldered front end, the slim and upswept tail and separate license plate holder convey a feeling of agility, underlining the NIKEN’s revolutionary style that is about to bring a whole new look to the streets of America. The NIKEN is designed to master a wide range of riding situations, and so in order to achieve high levels of straight-line stability together with sporty cornering performance, a new kind of hybrid frame has been especially developed. The head pipe area is manufactured from cast steel, while the swingarm pivot area is aluminum, and the main frame connecting these two assemblies is made from steel tube. By delivering the required levels of strength, rigidity and flexibility precisely where they are needed, this hybrid design enhances the planted and natural feel of the leaning double wheel front end, and ensures sport bike agility together with excellent handling performance. The NIKEN’s unique LMW three wheel layout introduces another dimension compared to a conventional motorcycle, and in order to optimize the NIKEN’s handling performance, a 552mm long aluminum swingarm is used. This is 15mm longer than the MT-09 design, and the increased length helps to give a strong feeling of stability when cornering. Another key design element is the riding position, and compared to the MT-09 the NIKEN rider sits around 50mm further towards the rear. This seating position gives an idealized 50:50 front-rear weight distribution with the rider on board – giving a natural handling and steering feel. In order to achieve sport bike handling capabilities, the NIKEN’s maximum lean angle extends to 45 degrees, and this has been made possible by the use of the Ackermann dual axle steering mechanism, together with a cantilevered suspension system mounted to the outside of the wheels. The double “external” upside-down front forks are equipped with rebound and compression damping adjusters that enable the rider to dial in their ideal suspension set up, and the relatively narrow 410mm track contributes towards the NIKEN’s natural steering feel – as well as keeping overall width to a minimum. The NIKEN’s rear suspension offers full adjustability for preload, compression and rebound damping, enabling the rider to set it up to suit varying conditions, and for convenience the preload can be set without the need for tools. With the high levels of grip and greater feelings of stability provided by two front wheels, the NIKEN has been developed to be an expert corner carver, capable of delivering a thrilling ride on winding roads. The double 15-inch front wheels are fitted with 120/70R15 V range tires that have been specially developed for the unique requirements of this leaning multi wheel vehicle. Offering high levels of grip, abrasion resistance and wet-weather capability, they contribute towards the NIKEN’s outstanding corner-carving performance. Dual 298mm front discs generate high levels of braking performance, and the increased surface contact area provided by the double front wheels enables the NIKEN to stop quickly and efficiently. The rear brake features a large diameter 282mm disc, and with these three large diameter discs working through three wheels, NIKEN riders have a high degree of control. The 847cc crossplane concept 3-cylinder (CP3) engine that drives the new NIKEN has been specially developed from the outstandingly successful powerplant that is also used in the MT-09, as well as the Tracer 900 and XSR900. To suit the unique requirements of the NIKEN, this torque-rich engine is equipped with special fuel injection settings that are designed to enhance this radical new motorcycle’s performance in the environment that it loves: twisty mountain roads. There’s also a newly designed crank that gives excellent drivability and smoother starts when accelerating from a stopped position. NIKEN riders also benefit from the latest electronic control technology including YCC-T, D-MODE, Cruise Control and a Traction Control System, as well as an A&S (assist and slipper) clutch and Quick Shift System that gives a high degree of controllability and fun riding in varying riding conditions. The premium quality and high overall specification of the NIKEN is underlined by the use of a beautifully sculpted aluminum fuel tank that has been created using the same advanced production technology as the YZF-R1 and YZF-R6. Featuring a smooth, flowing design that blends seamlessly with the wide shouldered front cowl, this lightweight fuel tank design features concave surfaces that give a firm knee grip area and allow the rider to move freely. With a capacity of 4.8 gallons, this high quality light aluminum tank gives a range in excess of 186 miles, offering the NIKEN rider the ability to cover rather large distances with minimal fuel stops. Another feature that reinforces the NIKEN’s premium look and feel is the black background of its LCD instrument display, which clearly displays all key information to the rider and gives excellent visibility, day or night. The NIKEN offers much more than high performance. Its premium specification and futuristic design open up a whole new dimension in terms of riding control, and enhance the fun and enjoyment experienced on every journey. And the reassuring feelings of stability and controllability inspired by its double front wheel layout are sure to attract many experienced riders who are looking for a new kind of vehicle. The NIKEN represents one of the most significant developments in the motorcycling world for many years. The ultimate corner carver has arrived, and a new icon will appear on American roads during the second half of 2018. The first 2019 NIKEN motorcycles destined for the US market are due to arrive in the 2nd half of 2018 in a Granite Gray color scheme, and the MSRP will be announced in the coming months. To find out more about the 2019 NIKEN LMW motorcycle, visit www.yamahamotorsports.com/niken.